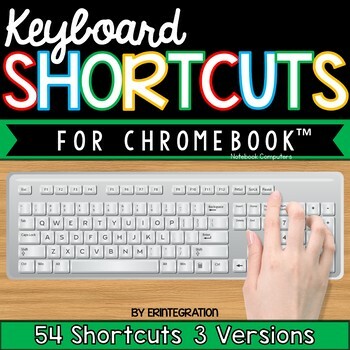 This set of Chromebook keyboard shortcut posters includes 54 Google Chromebook™ notebook computer keyboard shortcuts with pictures of keys in 4 styles. 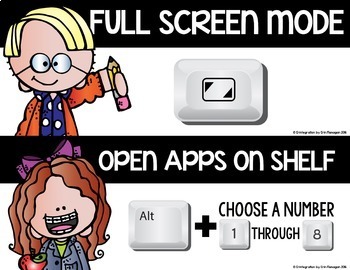 Help students develop technology fluency and become more efficient on Google Chromebooks in the classroom or technology lab by displaying these keyboard shortcuts on a bulletin board or wall. Also looks great hung underneath a bulletin board or down a narrow wall! 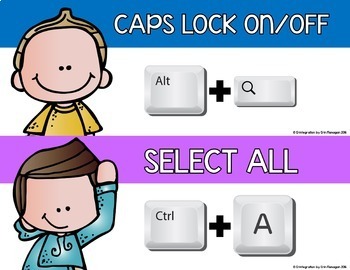 This set features accurate images of keys for visual learners & younger students. 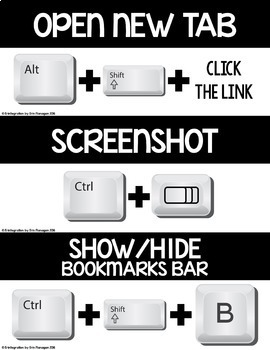 It also includes keys specific to Google Chromebooks! -54 posters with clipart and black headers. Each poster is 4.5 inches x 11.5 inches. -54 posters with clipart and rainbow headers. Each poster is 4.5 inches x 11.5 inches. -54 blackline posters without clipart. Each poster is 3.3 inches x 8.5 inches. -54 color posters without clipart. Each poster is 3.3 inches x 8.5 inches. Download also includes your choice of 3 signs for your display.